Reliable & super fast Internet in remote areas? Choose the right plan and boost your Internet Speed and Reliability – comBOX Satellite Link Bonding technology can make an impact on your business. Optimized bandwidth aggregation : IP-layer link aggregation of multiple Satellite Internet connections for increased bandwidth. End-to-End, bi-directional Quality of Service (QoS) : Ability to dynamically prioritize traffic on a per-packet basis over multiple Satellite Internet connections from the customer’s Network to the service provider’s core. Real Time Network Compression : Ability to accelerate compressible traffic types beyond the traditional speed of the individual Satellite connections. VPN acceleration : Ability to accelerate encrypted traffic over high latency Internet connections. Do you need high speed Satellite Internet access on your vessel? Take a look into a unique connectivity solution. By aggregating multiple satellite links into a virtual fat-pipe, the comBOX Satellite Link Bonding service bundles offer ultra high Internet speed for the advanced networking needs of yachts and ships. Have multiple Satellite Internet connections and wish you could use them all at the same time? 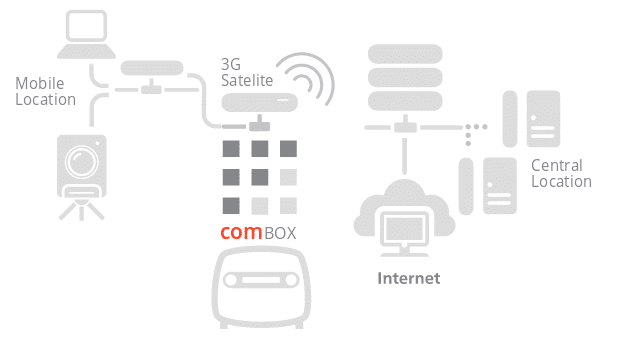 With comBOX Satellite Link Bonding service bundles you can combine multiple satellite Internet connections, even from different providers for faster and ultra reliable Internet in the most cost efficient way. comBOX Satellite Link Bonding service bundles have delivered solid and optimized solutions for the following indicative vertical markets.